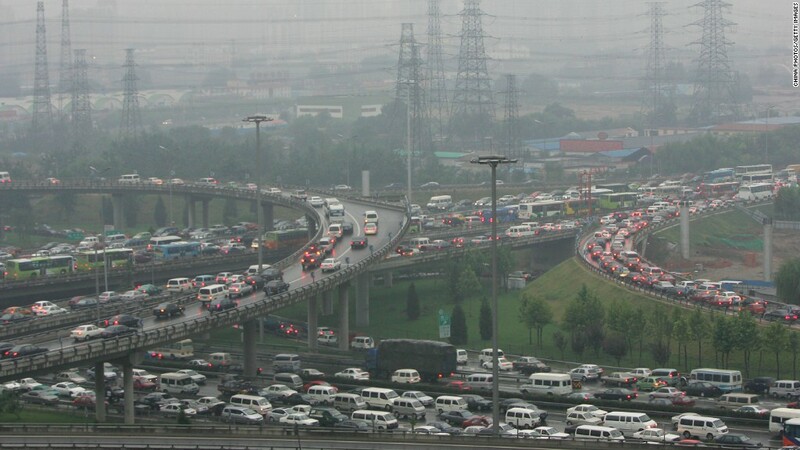 Pollution controls could put a damper on auto sales growth in China. China's booming car sales could take a hit this year as the government steps up its battle against pollution. The Chinese government is limiting the number of new vehicle registrations in many major cities this year in hopes of clearing the country's thick, smoggy air. Sales in the largest cities could be limited to 300,000, while a limited number of smaller cities will have caps closer to 25,000. On top of that, a group of cities are even banning some cars from the streets on certain days to lighten traffic and decrease pollution. Auto companies have in recent years expanded rapidly in China, where growing demand and rising wages have fueled a car-buying boom. China is now the world's largest car market, cementing the country's status as a top destination for automakers. But now, the government's new rules are expected to dampen China's auto-spending spree. In the short term, auto sales could benefit as consumers race to buy cars before the new restrictions are implemented. But that sugar rush won't last -- growth in passenger vehicle sales is expected to slow from an estimated 15% in 2013 to 10% this year, according to a report by Japanese brokerage Nomura. "Surging sales are expected to see a slowdown [in 2014] as government restrictions curbing new vehicle sales are enforced across cities in China, as the levels of pollution hit record highs in China," said Namrita Chow, an analyst at market research firm IHS. Last year, total motor vehicle sales in China grew by 14% over the previous year to reach 22 million vehicles, according to the China Association of Automobile Manufacturers. That's nearly twice as fast as the 7.6% growth rate posted in the U.S., where 15.6 million vehicles were sold. Companies like Ford (F) -- which boosted sales by 50% to almost 1 million units last year in China -- could be hardest hit by new restrictions. The U.S. automaker's Ford Focus led the competition as the top-selling model in China, followed by the Volkswagen (VLKAF) Lavida, Toyota (TM) Corolla, Buick Excelle and the Volkswagen Sagitar, according to a ranking by IHS. Automakers could skirt a slowdown in the major cities by shifting resources to smaller Chinese cities where government restrictions have not yet been imposed. "These smaller-tier cities are also where a large proportion of new, first-time car buyers reside, and it is these buyers which ... automakers aim to entice," Chow said. Some companies may also pursue growth in other emerging markets, such as Indonesia or Brazil, she said.